I love blackberry for this… It actually makes every Blackberry users feel the relevance of this season. 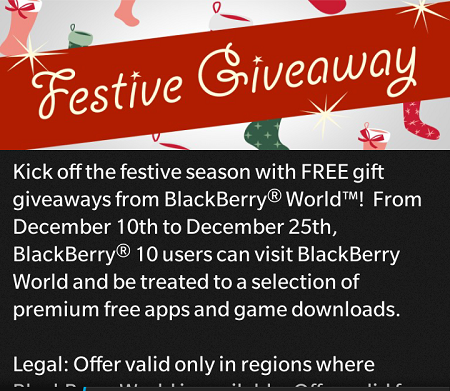 They had earlier this month opened up some selections of their premium applications and games for free download.The first batch of Blackberry giveaway apps included in the promo ran until December 17th, with another one which begun yesterday and will be closed on Christmas day. Now that the new second week free premium app download has begun, there is a whole new selection of popular and useful apps and games to choose from. 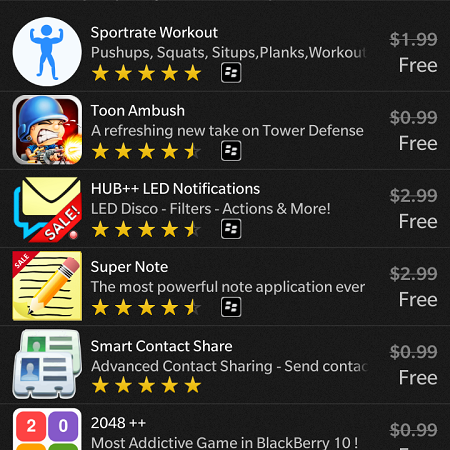 If you’ve ever admired or wanting to download a particular app on Blackberry appworld, then this is the time as great apps like Ultimate Backup for Blackberry, Dream remote, Notification Hub etc and exclusive games like Odyssey HD and many more. Z10, Q10, Z3, Z30, Q5, Passport, Classic and Porsche Design 9982 & 9983. Don’t miss out people, it’s the season.